some foods just bring back memories. 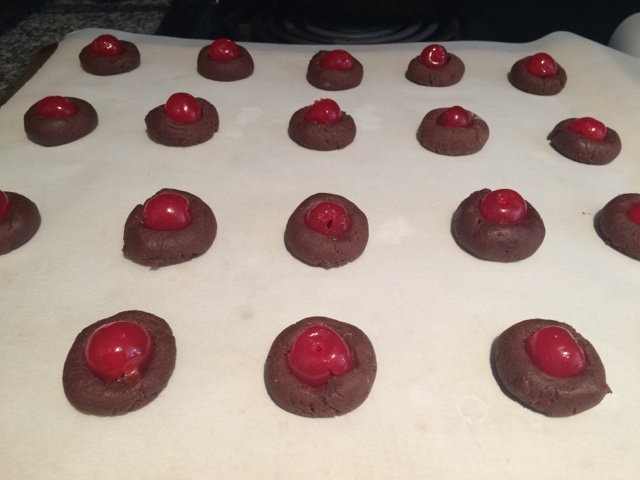 these chocolate cherry cookies remind me of college, specifically of living the soho (sorority house). we had a cook named debra who made breakfast, lunch, dinner and two desserts daily. I loved the desserts. I was even known to forgo dinner in lieu of dessert in my room. it sounds sad, but I assure you it was awesome. why would I eat fried catfish when I could cut to the chase and go for the lemon poppyseed cake? every year, the sorority house hosted a christmas morning breakfast before all the girls left for break. we anticipated this morning as much as the real christmas morning, except instead of presents - we got food galore, and fellowship of course. our house mom would play christmas music throughout the house, many of us showed up in our pajamas, and just like I liked - there were lots of sweets from debra. 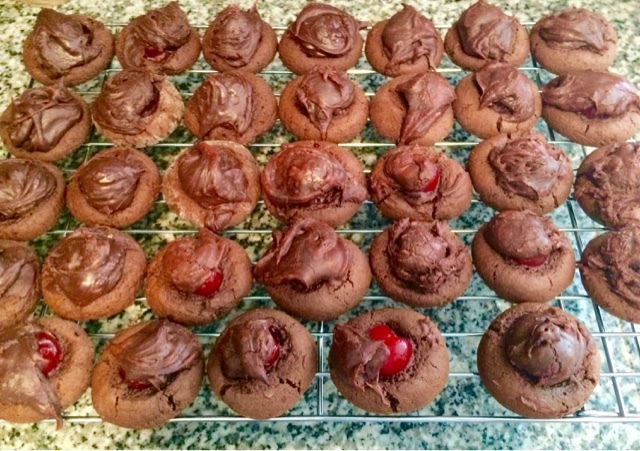 these chocolate cherry christmas cookies became a favorite of mine. 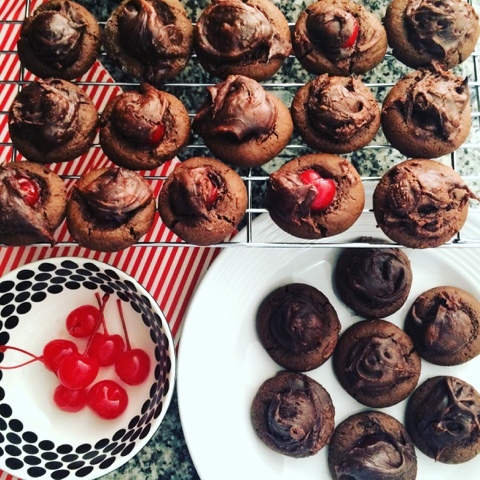 before I graduated, years ago, I remembered to get this recipe from debra. now that I have been long gone, and debra has retired, I still make these cookies and remember my college days. 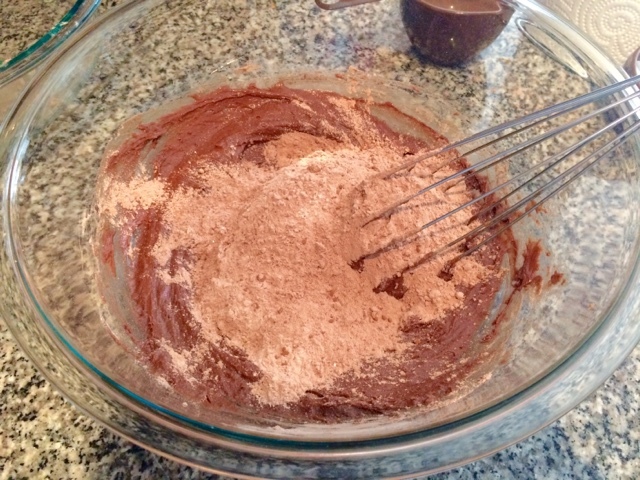 1. in a large mixing bowl, cream butter and sugar until smooth. beat in egg and vanilla. 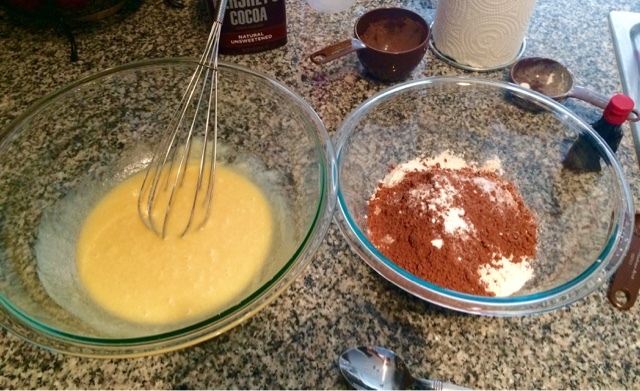 2. in a medium bowl, combine all dry ingredients. 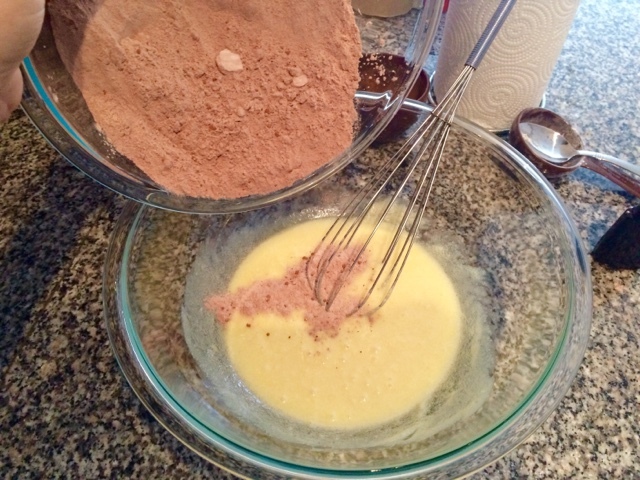 gradually add dry mixture into the liquid mixture and blend until thick and smooth. 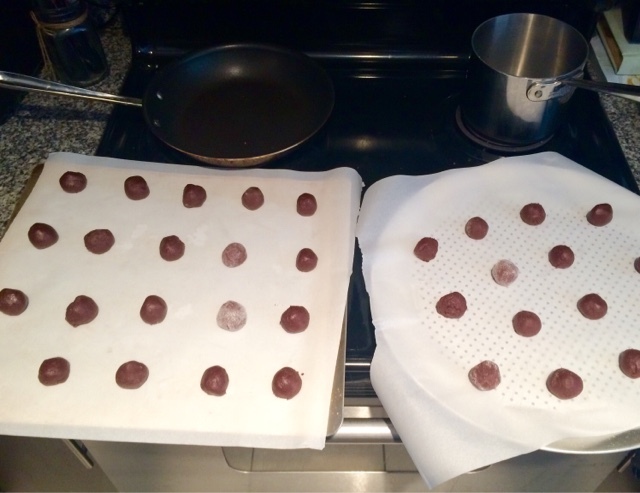 3. shape batter into roughly 48 balls and place on parchment-lined baking sheets. 4. push one cherry halfway through each ball. 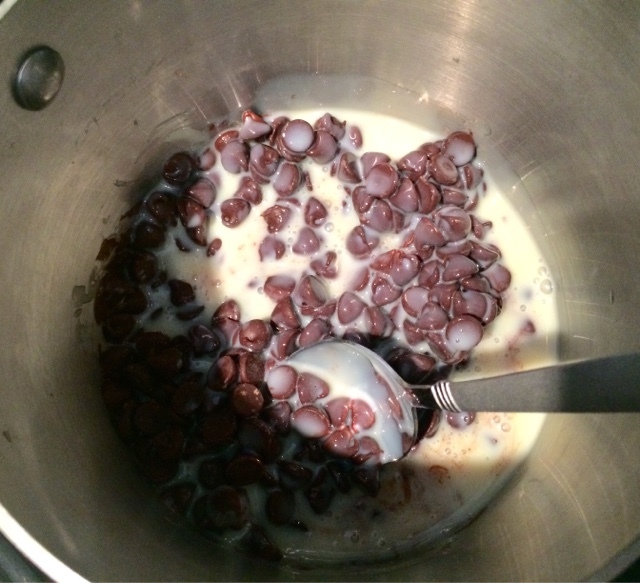 5. meanwhile, combine chocolate chips and sweetened milk on the stovetop. stir constantly over low heat until thick and smooth. remove from heat and add cherry juice to thin the mixture. 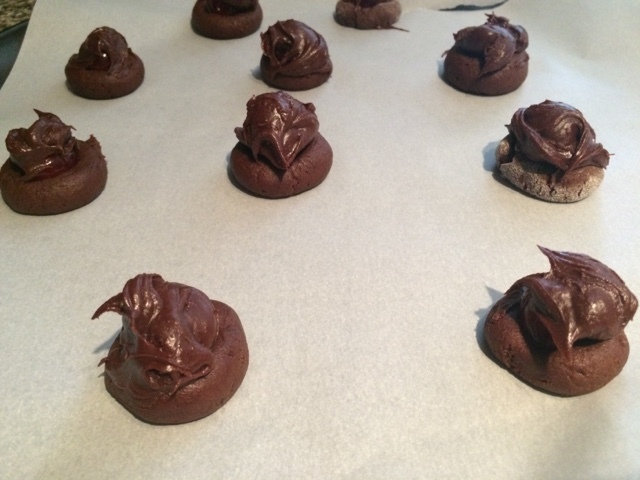 6. spoon a teaspoon of frosting over each cookie and bake at 350 degrees for 10-12 minutes. 7. let cool and transfer to cooling rack. enjoy!